Phyllis Odessey: Does The Living Wall Need A DNR Order? Kari Elwell Katzander says NO. Does The Living Wall Need A DNR Order? Kari Elwell Katzander says NO. 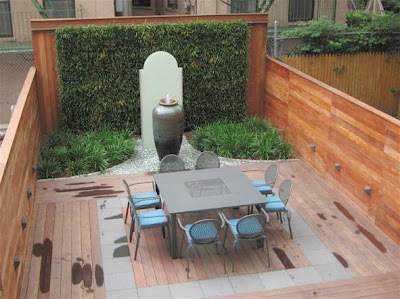 "Kari Elwell Katzander, owner of Mingo Designs, describes her self as one who "creates outdoor environments that redefine traditional city spaces. 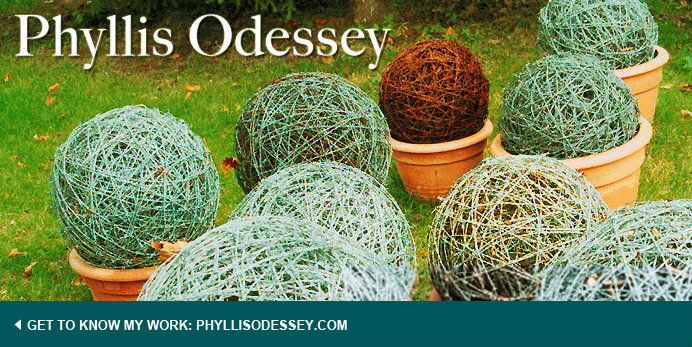 Transporting the inhabitant through our garden installations, clients are suddenly in the eye of the cosmopolitan storm." 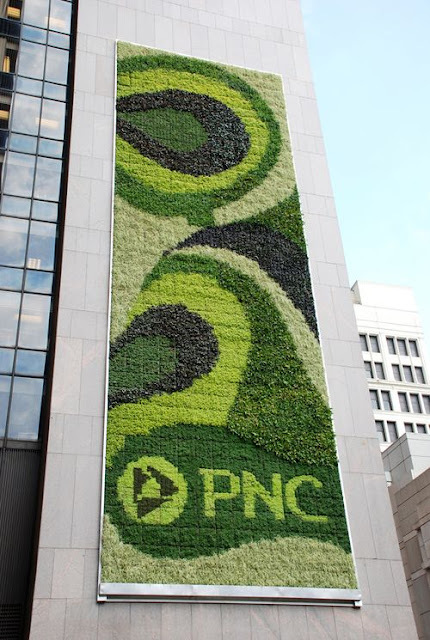 Kari is the designer of the largest green wall in North America: PNC Bank building in downtown Pittsburgh, PA. It is a south facing wall on a 30-story building, made up of 602 modular panels, holding roughly 24 plants each and covers an area of 2,380 square feet. According to Green Education Services, "The wall coverred by the installation is already performing as expected, with temperatures behind the green wall approximately 25 percent cooler than ambient temperatures. Altogether, each of the 602 panels provides enough energy savings to offset the carbon emissions equal to that made on behalf of a typical person." That sounds pretty impressive. And thanks to Kari, who is particularly forthright, the living wall is still in its experimental stage. She is constantly tweaking the components and the system she has devised. She showed several examples of residential installations in her talk on Monday night. Apparently a livng wall is a hard sell. And the more she talked, the more I understood why and more I questioned the entire green premise of a the living wall. Here's the deal. 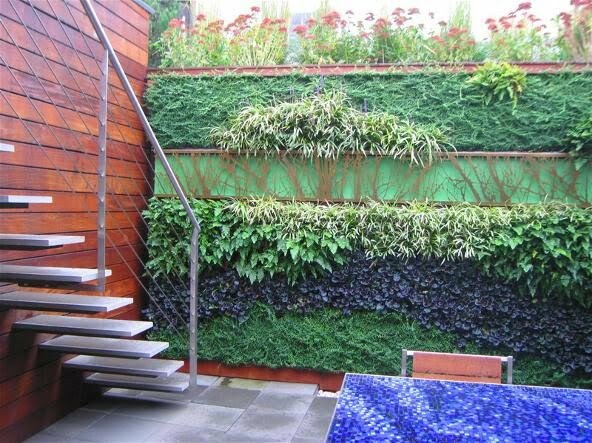 A living wall is challenging. Plant Connection, Inc. is the nursery, Katzander uses for all her green wall material. They grow the plants in modular panels made out of stainless steel or aluminum for a minimum of 6-8 weeks, in order to allow the roots to get established in a horizontal position. Every panel has its own irrigation tube. Of course, the plant material varies depending on light conditions and zone. However, Kari pointed out that maintenance is required every two weeks. Plants are routinely cut-back and eventually the plant material needs to be replaced. Whether growing in 3" or 6" eventually the plants will become root bound. I began to wonder, if the whole idea, which is sold as part of the sustainable gardening movement, is really more part of the Emperor's New Clothes Movement. By the time you add up the initial cost, the maintenance requirements, the water usage and eventual replacement of all the plant material: how much energy savings really exist? Kari's intention may be to put her clients in the eye of the storm, but its likely that the work itself is the eye of the storm. That's gardening creativity put in real use. Artistry!! I'm ambivalent about green walls. Sure, they're impressive eye candy. But shouldn't one of the goals of the green movement being knowing enough to quit trying to mess with nature?